The evolution of contemporary design falls back upon Victorian and Georgian architecture. Despite all the differences between them, the roots of designing today lay in the ancient style of designing. Victorian period of interior design. The Victorian era was in between 1837 to 1901 when Queen Victoria reigned in Great Britain. This was the period of Industrial revolution where the division between the various classes was not as prominent as in the Georgian period. Development of Trade, construction and engineering was on a rise and the middle class was also constantly rising. Getting a house built was not confined to the city or the rich anymore, even the middle class in the suburbs could afford a house. The Middle Classes, created by manufacturing, trade and engineering were becoming a major economic force. Due to mass production, reasonably priced furniture and interior goods were more easily available to the middle class unlike the previous times where such things were available only to the wealthy class. Hence, the middle class living in the suburbs were also able to show off their status and lifestyle. The main reason for development of Interior Design in this era was Industrial Revolution and expansion of British Empire. The most prominent development that Interior design saw in this era was “Bold Colours, gilding, ornate carving, Flocked stamped or painted wall coverings and deeply buttoned upholstery that were all lit up by an assortment of candle and oil lamps which gave the rooms a warm and cosy glow.” The houses were neatly divided in rooms with proper demarcation between the public and private rooms. Victorian men and women both wore fashionable clothes that were modified over time, the women wore decorated gowns with several accessories including elaborate hats, purses, parasols and shoes. Since the Victorians kept themselves highly polished and adorned, the same could be seen in their designing as well. Colours played an important role in Victorian designing and several new colours evolved during this time. The walls were divided in various sections with different colours on them, even the cornice were adorned with various colours. There was intensive use of hand painted wallpaper as well. Plasterwork was also very popular with large ceiling roses and detailed cornices. Another important feature of that time was highly decorated cast Iron fireplaces. The furniture was heavily carved and inlaid. Heavily carved hall cabinets, carved mirror cabinets and whatnot were of great significance. Houseplants and folding screens were popular accessories. Victorians made use of a collection of accessories for their interiors, right from stuffed birds and animals to oil lamps and mirrors. One could find it all in a Victorian house. Various fabrics were used for table covers, piano covers and other accessories. Velvet, satin, plush, silk were some of the most popular fabrics that were used around that time. Victorians loved decorations and ornamentation and this may have been due to easy and affordable decoration goods. A typical Victorian house can said to be cluttered with goods and overly decorated. The Victorian designing was multilayered where every surface was used to decorate in some way or the other. Unlike the Victorian, the Georgian architecture was more sophisticated and their interiors were highly inspired by the architectural designs of Ancient Greece and Rome. Their architecture was very proportionate and because of their elegance and simplicity their designs are found in contemporary living as well. The reason Georgian Properties are appreciated even today is that their properties are very spacious, giving enough space to every piece of art. Similarly the contemporary designs are very spacious with minimum pieces of decoration. Just like the Georgian architecture, the Contemporary homes are also very neatly divided between simplicity and elegance. Hence a lot of contemporary designing has been inspired by the Georgian designing, although there are several differences as well between the two. However, there are several differences between the role played by the Interior designers of the two eras. During the Georgian era the Interior designers made a significant use of different colours in designing a particular space, it is not so in contemporary designing. Limited use of colour is made by contemporary designers. For example, today, there is more use of white, grey, black and brown colours with a tinge of other colours. Whereas in the Georgian era there was less use of these colours and more of Burgundy, Soft Blue, Dusky Pink, Green etc. Interiors were more colourful at that time. Also the Interior designers of that time gave extreme importance to wall coverings and treatments. Painted wallpapers, classical frieze details from Pompeii and Rome were extensively used. The Interior designers of that time worked very hard to give different designs and colours to the walls and the ceiling. Plaster mouldings were very important and ceilings were heavily decorated with ribbons, classical figures and urns. The contemporary designers on the other hand like to keep the walls simple with very light wallpaper and very less or no plaster mouldings. For the Georgian designers, fireplace was another very important part of interiors. They always went for very elaborate and heavily decorated fireplaces. However the contemporary designers do not lay too much of emphasis on fireplace, most homes do not even have a fireplace and even if they do, they are very simple metal cases with no elaborate decorations around them. easily available at that time and Interior decoration was mainly confined to the rich and wealthy class. This was mainly because things were handmade and were manufactured mainly on the instructions by the designers. The designers themselves deigned everything right from the plaster ceiling to the matching carpet on the floor. They had to design everything including fireplaces, paintings, wallpaper, furniture and much more. The work of a contemporary designer is much more simple today because most of the decoration items are easily available in the market. The designers today play a very different role, they understand the taste of the user and then organise things in a way that is both beautiful and comfortable. The contemporary designers mainly focus on the 7 basic elements of designing which are – Space, Light, Objects, Form, Furniture, Colour and Texture. Furniture had become a prominent status symbol in the Georgian period. The material that was used at that time mainly comprised of walnut, satinwood, rosewood, tulipwood, and mahogany with chintz and silk upholstery. Their furniture had a strong Chinese influence with ball and claw feet and shield back chairs. However, contemporary furniture is more simple with wood base and upholstery on top. The use of Leather and glass in furniture is very common in the designs of today. The furniture used today is more simple with either fabric or leather seats and wood or laminated material tables with Glass on top. Also, there is very limited furniture in a room and sofas, chairs and tables mostly have wood or stainless steel legs. The use of steel is really growing in contemporary furniture. The walls of the Georgian period were divided on colour basis and decorated with wallpaper and various other designs, they even laid a lot of emphasis on plaster mouldings and very detailed cornices. For example, in a Georgian home it is very common to see a different colour at the bottom of the wall, then a different colour in the middle and then again a different colour and design on top right under the cornice. However, under the contemporary designing, the walls are simple with very less use of different colours with very plain or no cornice. 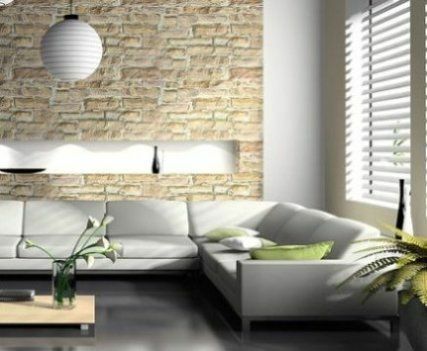 A good example of a contemporary layout for the walls of a room would be the use of very light colour on the sides of the wall and of darker colour or wallpaper only on one wall or one area in order to highlight that wall or area. Unlike today, even the ceilings of the Georgian era were heavily decorated with ribbons, classical figures and urns. During the Georgian era flooring was mainly done with cheaper softwood like pine or expensive hardwoods such as oak that was stained, varnished or painted. The floors were decorated with elaborate rugs with designs similar to that of the ceiling and most of the time the same architect would design both of them. On the other hand under contemporary designing the flooring is mainly done with polished wood, marble or Granite tiles depending upon which country one is residing in. Most western houses are wall to wall carpeted with a plain colour carpet except the bathrooms and the kitchen area. Decorative rugs then placed on top of this to enhance the colour scheme of the area. In the Asian houses the use of marble and granite flooring is much more. The floors are then adorned with decorative rugs that are easily available in the market. The Georgian designs comprised of large wooden windows that were either waxed or painted. They had large windows that gave enough light. However under contemporary designs as well the window treatments remain almost the same just that there is more use of curtains to enhance the beauty of windows. Even today a lot of people like to have a blend of Georgian and Contemporary designing simply because they both are spacious, beautiful and elegant.